From my experience of working with leaders and teams, when I mention “emotional intelligence” you easily see the confused looks on their faces. Some people think it is similar to your IQ in that you are either born with emotional intelligence or you’re not, or it is a special gift or talent that only certain people have. They think of emotional intelligence as a complex leadership competency that doesn’t resonate or relate to them in any way. 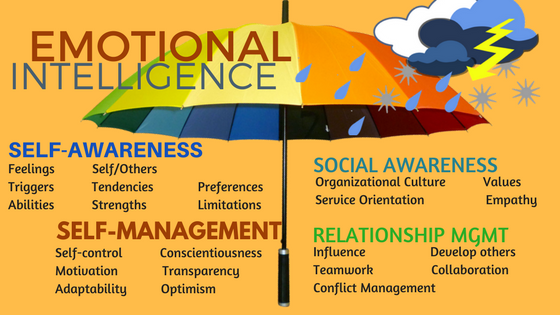 What does Emotional Intelligence really mean? Emotional intelligence (EI) is quite simple. Emotional Intelligence is your ability to be aware of and understand your own emotions as well as the emotions of others. Much like IQ, some think your “EQ” is something you’re born with. While that may be true to a degree (I will address that in a later blog), the good news is emotional intelligence is nothing more than a flexible set of skills that can be developed and improved with practice. Self-Regulation: The ability to control or redirect disruptive impulses and moods; the ability to suspend judgment — to think before acting. Motivation: A passion to work for reasons that go beyond money or status; to pursue goals with energy and persistence. Empathy: The ability to understand the emotional makeup of other people; skilled in treating people according to their emotional reactions. How do I know if I’m emotionally intelligent? One thing that I have found very common — and interesting — is that most leaders already think they are emotionally intelligent. When I ask my executive clients how they would rate their level of self-awareness, self-regulation, motivation, empathy or social skill, they generally give themselves an A+. However, when they take an emotional intelligence assessment, the results reflect a different grade — one that typically catches them off guard. Emotional Intelligence 2.0 by Travis Bradberry – Bradberry’s book/assessment measures your emotional intelligence in 4 specific areas (self-awareness, social awareness, self-management, and relationship building). What I like about this assessment is that you take the assessment twice — once to get a benchmark and to identify specific skills for development, and then again in 6 months to see how you’ve improved. The cost for the book and the assessment is around $20. Emotional Intelligence Test by Psychology Today – This online assessment takes about 45 minutes to complete. You receive a FREE snapshot report with a summary evaluation and graph. You then have the option to purchase your full results for $9.95. I completed the EI assessment, now what? Once you’ve completed the assessment, take time to thoroughly read your results. Pick one EI skill (self-awareness, empathy, social skill, etc.) and identify one or two strategies that you can commit to over the next couple weeks that will help you improve your EI in that area. Once you’ve taken the assessment and identified your skill development opportunity, post your commitment on Twitter to @ValeriePlis #strengthsbuilders OR the StrengthsBuilders LLC Facebook page to enter into our November contest. We will have a drawing for a $25 Amazon Gift Certificate for the folks who post their commitments to Twitter or Facebook!